This post originally appeared on Michael’s Forbes blog on September 18, 2017. You can read the original post on his blog here. I never thought I would start a blog post with such an audacious claim about the journalistic acumen of The Economist. However, having just finished reading The Economist’s September 1st cover story on Silicon Valley titled: “a victim of its own success,” I felt compelled to note some items that the highly-regarded publication missed in its cover story. As a quick aside added for perspective only, I worked in the tech industry in Silicon Valley for nearly 20 years, living there from 1997 to 2015. I decided to leave the Valley and relocate to Austin, Texas to start a venture capital firm called Next Coast Ventures. You might expect that I would celebrate any publication’s declaration of the “death of the Valley” as support for my own personal decision, but that’s not the case. Many of the observations in the article about the challenges of living in Silicon Valley are dead on and support the assertion that the Valley has “peaked.” I’m going to highlight some of the more salient points in the article below because they’re noteworthy and I agree with them. However, it’s the conclusions the article drew from these assumptions that I disagree with. 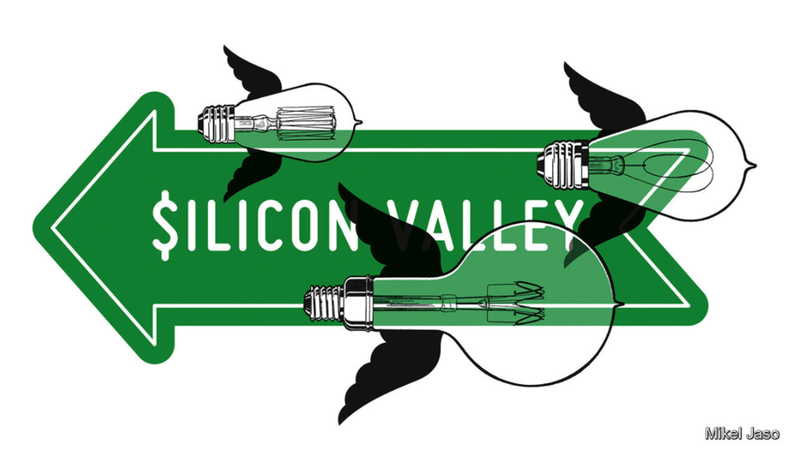 The Valley is an extremely expensive place to start a company. 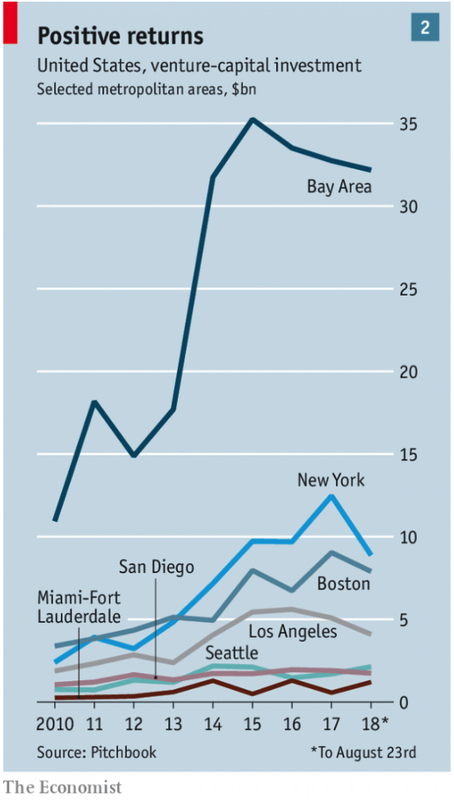 As noted in the article, one founder “reckons that startups pay at least four times more to operate in the Bay Area that in most other American cities.” I am not sure it is four times more expensive, but in my experience, the engineering talent in the Valley is at least twice as expensive as it is in markets like Austin or Salt Lake City. This cost difference is not just for engineering talent in the Valley anymore – it is across the entire organization. So when an entrepreneur starts a company outside of the Valley, the capital required is lower and will last longer, allowing founders to avoid that nasty little thing called FOUNDER’S DILUTION. New technologies are making it much, much easier to start a company just about anywhere. The article notes that “thanks to the tools that the Valley’s own firms have produced, from smartphones to video calls to messaging apps, team can work effectively from different offices and places.” Now, more than ever, talent can be sourced and located anywhere – so the need for entrepreneurs to limit their talent sourcing to one specific geography is simply irresponsible. This assertion, however, should not be seen as “anti-Valley,” but rather a great opportunity for anyone competing in the war for talent, regardless of geographic location. The article is right about innovation happening everywhere: “Capital is becoming more widely available to bright sparks everywhere: tech investors increasingly trawl the world, not just California, for hot ideas.” At my firm, Next Coast Ventures, we are consistently amazed at the quality and quantity of great ideas from impressive entrepreneurs we see every day both in at our office in Austin and the Next Coast markets we routinely visit. The Economist article sees this as a strike against the Valley – however, I think this is the beginning of an incredibly exciting story about innovation and expansiveness, and the ability to build great businesses just about anywhere. Per the vivid pictured painted by the article, the Valley is a tough place to live: “the nastier features of the Bay Area life: clogged traffic, discarded syringes and shocking inequality.” And don’t forget ridiculously expensive housing prices. I lived in the Valley for a long time and these factors have only gotten worse, not better, over the past 20 years. I miss the creative energy of the Valley and would argue there is no place like it on earth, but it is expensive, crowded, and in some ways, a bizarre place to live and certainly a hard place to raise a family. Competition for talent, especially engineers, is intense: “Apple and Facebook pay their employees so generously that startups struggle to attract talent.” This is very, very important point for any entrepreneur looking to start a business. Five or ten years ago, startups in the valley could lure away talent with the promises of big equity upside thanks to low pay and stagnant equity prices at the tech behemoths like HP or IBM. But now at companies like Facebook, the median salary of an engineer is not only $240,000 (according to The Economist's article), but Facebook’s stock has also increased 268% over the past five years. Therefore, the risk-reward equation for an employee with a hefty salary and competitive stock options to leave a large company to go to a startup is a much, much harder calculation than it has been historically in the Valley. These are all significant, astute data points that are certainly pointing to a tangible shift in the innovation and investment ecosystem in the Valley, but the conclusions the article draws from these inflection points is where my aforementioned strong disagreement with the esteemed Economist comes in. All of these points are compelling reasons for any entrepreneur to consider starting and growing a company outside of the Valley. However, I disagree that all of these signs point to less innovation, lower opportunity and the inevitable downfall of the Valley. I would assert, rather than “peak Valley,” this all points to the massive opportunity for “Next Coast” markets to help drive overall global innovation and entrepreneurship. 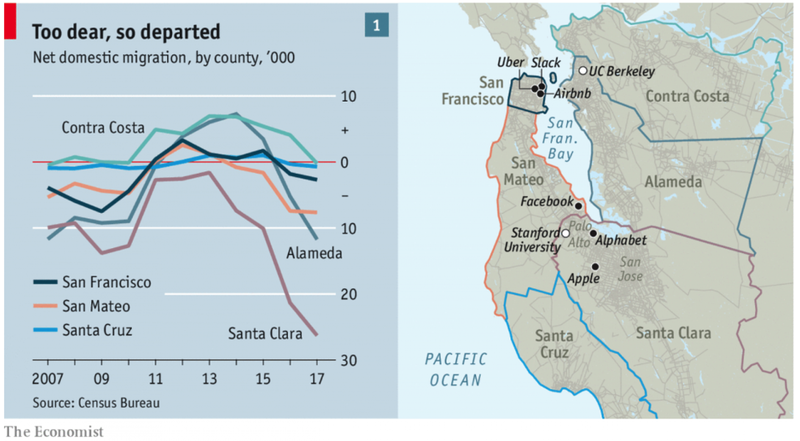 I simply do not agree that these are “signs that they Valley’s influence is peaking.” The article highlights that “in 2013 Silicon Valley investors put half their money into startups outside the Bay Area; now it is close to two-thirds.” The flow of capital into “Next Coast markets” is not a sign that Valley’s influence is waning – far from it. Ask any entrepreneur if they would turn down interest from the preeminent Ventures firms in the Valley (Benchmark, KP, A16Z, etc.) and they would say “heck no.” Rather, this flow of capital is really a good sign of what Steve Case calls “The Rise of the Rest.” That is: innovation is happening everywhere – and the Valley will always be the epicenter – but it is now ALSO happening in a much more prevalent manner in markets outside of the Valley. It is shortsighted to believe that as talent, innovation and capital spread from the Valley that its influence won’t come with it - and there is clearly enough to go around. 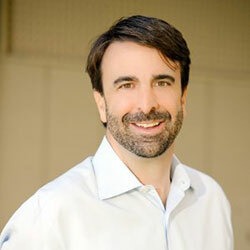 Michael Smerklo, Co-Founder and Managing Director of Next Coast Ventures. In summary, I would assert that the article is only half right – the data points they highlight about Silicon Valley are correct, but their assumptions about what that means for the future of innovation are wrong. What is really happening is not as the article claims a “warning that innovation everywhere is becoming harder,” but rather a timely, exciting opportunity for areas outside of Silicon Valley - what we call “Next Coast markets” - to grow and prosper as additional, rather than replacement, innovation hubs. Cities like Austin may never replicate the Valley (and that is okay), but instead are well on their way to becoming a different, but equally appealing, innovation hub for the next generation of great technology and technology-related companies - and we’re excited to be here working with those companies every day.